On the internet many people are quick to jump on the band wagon when it comes to complex and covert conspiracy theories. What about the more obvious conspiracies? What about the ones that can be proven with straight up facts? Here is the elephant in the room no government official will ever talk about in a press release...over population. Over population is something we cannot get around. This is a fact. We are multiplying faster than cockroaches and we destroy the Earth every day with our power plants and huge factories. That is a fact. There are close to 7 billion people that live on Earth. That is a fact. We are destroying the Earth in more ways than one with all of the pollution that we create. In Beijing, China it is hard to even walk around. Many of the people are forced to wear hospital grade face masks because of all of the pollution in the city. They are also scared of epidemics that spread like wild fire because of the close proximity of other families and other airborne illnesses. 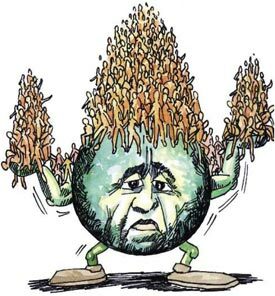 Many of the global elite like Bill Gates have spoken publicly about their plan to lower the global population by 15%. This is the percentage they are willing to admit publicly. They really want to bring the population to about 500 million. That is more than a 90% reduction to Earth's existing population. Why did Bill Gates come out and say this? To get us talking about it. He is not an elected government official, and he is not involved in politics. Perfect guy to break the news. Their plan, through subversive means, is to add toxins to the world's drinkable water supply both at the bottled water level, and also underground aquifers. They are putting chemicals like fluoride in the water to sterilize the population, as well as creating new vaccines with mercury in it (including flu-shots) so that they dramatically change our reproductive systems. This is a fact and all you have to do is research these subjects. Think of how many toxins we are drinking as "taste enhancers" and fillers to make us feel satisfied. Pepsi and Coca-Cola (who also own Frito-Lay, Dasani water, and other addictive chemically enhanced consumable products) are doing the same thing to their products. They are nothing but high fructose corn syrup dealers. They are not the only ones either there are way more examples and the list goes on and on (Hersheys, Nestle, Mars, Blue-Bell, etc). Do you know what the shelf life of a Snickers candy bar? Neither do I. It can last years on the shelf and still be eaten without you getting sick. I'm sure you will even feel "satisfied", but you are poisoning your body with all the chemicals and preservatives and who knows what else. We know high fructose corn syrup is a carcinogen (cancer causing chemical). We also know that if you consume these products you will slowly become addicted. Addicted to chasing the "satisfaction" you get from these types of products. This is an addiction worse than cigarettes, and you will require this type of food on a daily basis. Monsanto genetically engineers fruits, vegetables, and other crops such as corn (to make high fructose corn syrup) so that they are easier to grow for the farmer. They now have lettuce, tomatoes and corn that when planted have its own pesticide. This means that the pesticide is engineered in a lab to grow in the plant's genetic material or DNA. It is obvious that traces of this pesticide which is really a form of bacteria, is still in the modified crops when we are consuming it. People try to grow organic, but in most places trying to sell your own "organic crops" is a crime. I recommend everyone check out the documentary "Farmeggedon" it is on Netflix right now. Bill Gates talks about population control. This is what they talk about at Bilderberg meetings. Yes, Bill Gates is a member. Where is the mold on this McDonald's hamburger? Do you think this is natural? Bro - your post is confusing - what's wrong with trying to lower the population? It's doubled since I was a child and even then, in the 70s, we worried about it. You seem to indicate its a problem then rain on the parades of those doing something about it, however covertly. I say, more power to the less people! Thanks for reading Erich. I understand that this post can be a little confusing...I too understand the benefits of the population decreasing. Have you read my bottled water conspiracy article? We are killing ourselves, and this planet slowly. We are multiplying super quick, but who would volunteer to be on the cut list? This article was created to discuss these plans. Our opinions don't matter in this situation. Instead we should be looking at the facts and assessing the possible panic that will inevitably result from this. This article is not based on speculation.